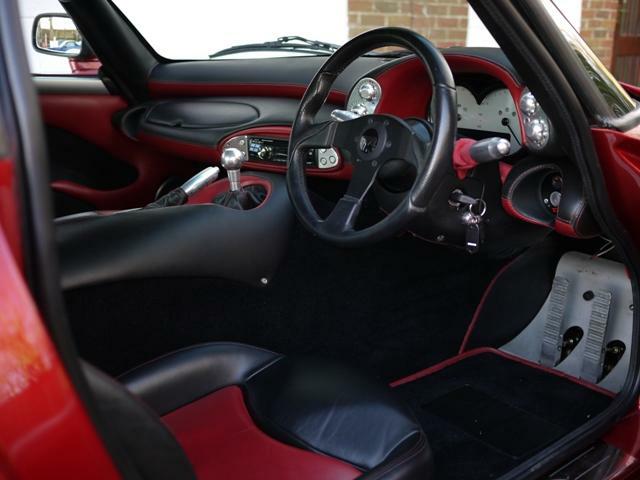 Our TVR is in lovely condition, but the ‘Bison’ interior doesn’t quite live-up to the shiny looks of the outside. 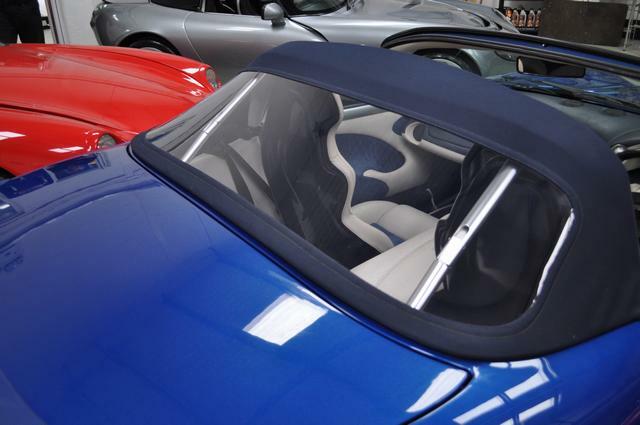 TVR’s Bison trim is a synthetic leather and was a lower-cost option when ordering a car. Apparently it looked very nice when new, but ages worse than leather and then starts to look a bit dirty and in our car some of the surface is flaking off slightly. When we looked at cars, not all the cars with full leather were that good either, some may have not been cared for very well and looked quite worn, sometimes with split bolsters on the seats. While no means essential, and the car still looks quite good in my opinion, a re-trim would be a big change and make it look a lot more exciting. 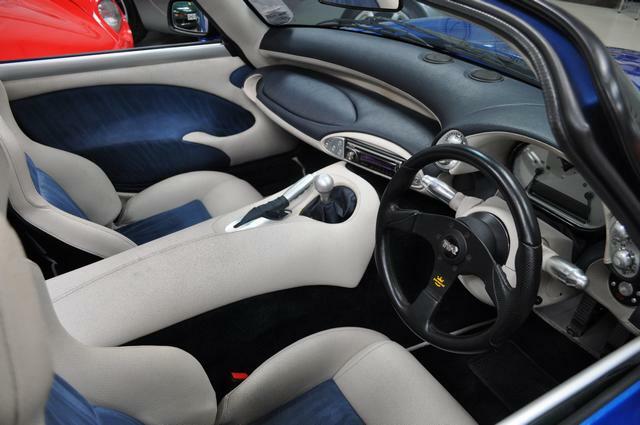 A full re-trim includes the seats, carpets, door cards, dashboard and a few other bits and pieces. 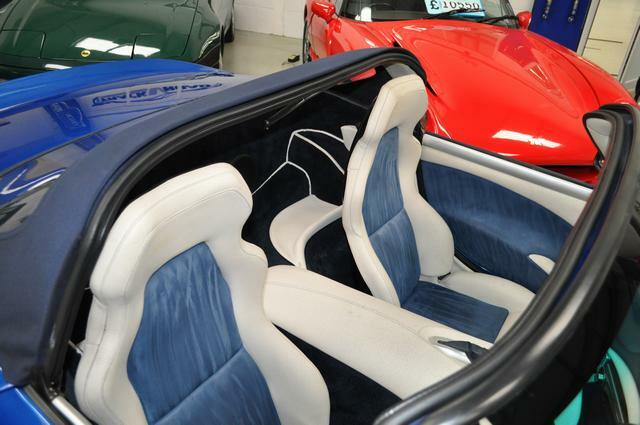 It can also be a good time to get the seat-backs sprayed to match the car’s paintwork (rather than just being black). I have spoken briefly to two companies about this both of whom have very good reputations. They were both very helpful over the phone. Second was The Trim Technician. Based in Blackpool, and he quoted in the range of £2600 to £3000, excluding steering wheel (it is black, and probably doesn’t need doing). The car appears as below, although I think the pictures are a bit flattering. Well, a fun day of finding out more about the car. In two weeks time I will be out bright and early to drive to Center Gravity for a suspension ‘health check’. 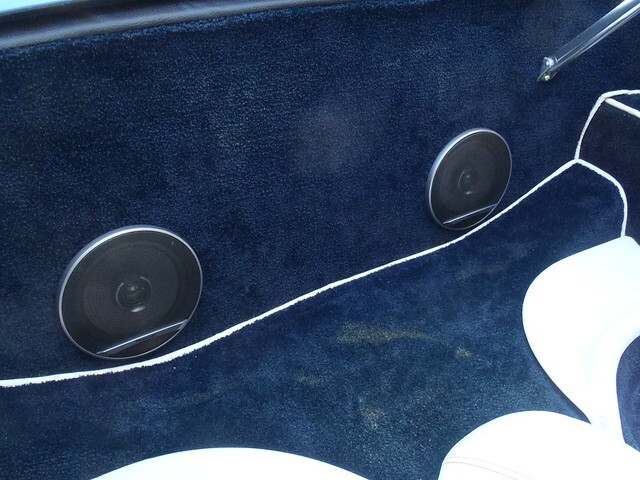 The result should be a better knowledge than I currently have of the car’s setup. Chris from Center Gravity has a very good reputation and it will be good to know his views on the setup accompanied by some accurate measurements. Chris also has plenty of views on the brake issues so it will be good to discuss those with him. When that is done, I will drive 30 minutes to TVR Power to take the car on their rolling road. From this I will get to know the power / torque of the engine, the air-fuel ratio throughout the rev range, and an expert view on how well it is running. Should be a good day out – unless I find things are wrong. But better to find out rather than be surprised at some point. I have exchanged a couple of e-mails with a helpful chap at AP Racing. They supply TVR Power with front pad # CP6600D55-DS2500 and rear pad # CP3915-42-DS25HP . So the front is a Ferodo DS2500 branded as AP, and the rear DS25HP is a “comfort version (low compressibility) of the DS2500 but fairly similar in performance”. “Comfort basically means road pad with no noise issues; although not always the case with performance pads but that also depends on the installation. So where DS2500 may produce squeal on certain installations 25HP may cure it and on a rear end light load pad that’s also required as a park brake then 25HP would be the best option i.e. works from cold but with good fade resistance. Low Compressibility reduces pedal travel. A link was provided to an AP Pad Characteristics chart. So you could fit CP6600D55-APF404 to the front. But don’t think it’s the pad compound causing the imbalance, these are both road car compounds so need to work from cold and I doubt you got top the point of fade for either yet? The APR bias valve if plumbed in correctly will reduce rear line pressure, with a very slight delay as the valve comes into operation. The rear brake being a single pot pin slider, must be fairly small regards piston area and disc diameter when compared to the front 4 pot set up, so I would expect front bias to be designed in. It looks like I could do a bit of work if I can find the piston areas to see what the brake force distribution is like in the static case. Not sure how to test the master cylinder other than to have it changed. Very useful responses from AP. I knoe exactly what rear pads are fitted, but am not 100% sure about the fronts. They should be the D2500 compound, but I haven’t seen it for myself. 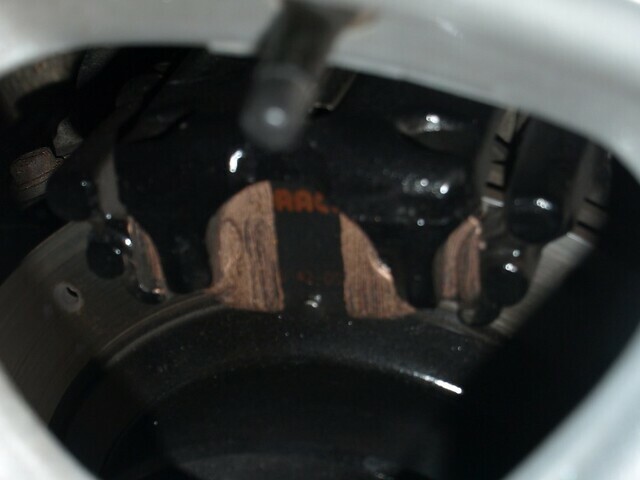 Having re-found this photo that I took of the rears after fitting, I at least know exactly what they are. I had a chat with Jason at TVR Power yesterday. AP Racing DS25HP is apparently very similar to the Ferodo DS2500 pad, but different. That was the impression I got. 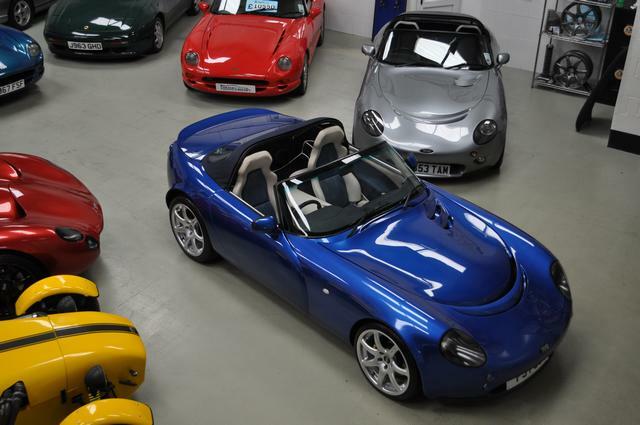 TVR Power sell the front pads for £95 + VAT. Use of their rolling road was discussed. It costs £75 + VAT per hour. May try to get out there for a morning in November, get it on the rolling road and either collect the pads or have them fit the pads if I feel lazy. Also had an e-mail from Ford – apparently their technical people have sent me some information through the post, so hopefully that will arrive soon and I can find out the specification of the standard valve. The brake bias saga rolls on. I have spoken to TrackVRoad and Dom and TVR Power about this. Dom’s thoughts were that it could possibly be a master cylinder fault and that it would be worth getting the car onto a rolling road brake tester at an MOT station. 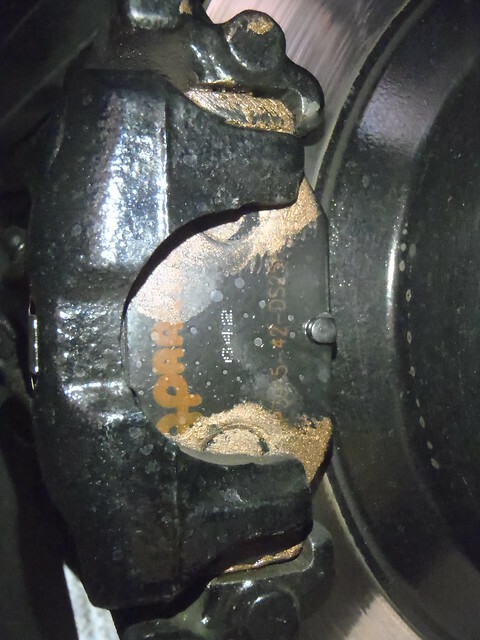 If these exist to do both axles simultaneously it would give an indication of the brake balance without transfer, and could give a baseline before any adjustments are made. If they only work on one axle at a time (i.e to check balance across the car) then that is not good to me since calibrated pedal pressure would be needed to make comparisons. 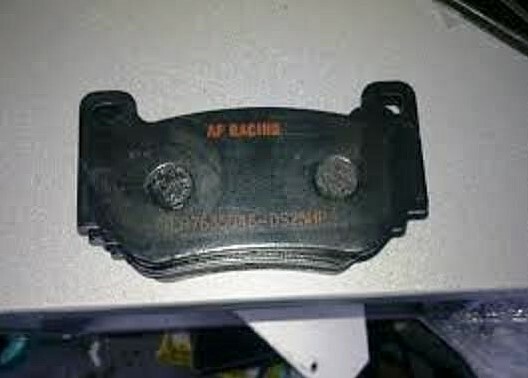 This might be AP Racing’s DS25HP pads, as mentioned when I was discussing the problem with AP. See picture below – That pad is for a Lotus. If I don’t get a reply to my e-mail soon then I will call again. I may ask about the cost of a quick rolling road session as well so I can find out how the engine is doing and try to ID the slightly strange noise at high revs and full throttle. Sounds like an irregular ticking from the exhaust manifold. I had a number of chats with Ian and TrackVRoad. He thought the spring rates on the Gaz Gold Pro kit fitted to the Tamora were 425 front and 325 rear. I think that is lbs / inch. There is a single tandem master cylinder for both front and back brake circuits so initially (before the limit valve) the same pressure is applied to both. The limit valve is a Ford part. We discussed a front brake pad change, and apparently this is quite easy. They use a syringe and some tube to take brake fluid out of the resevoir when doing a pad change. After a reminder, I got the part number for the valve from TrackVRoad (thanks Craig), and have started to try to track down the specification of the standard valve. It is TVR Part Number J0744 or Ford Part Number 7 117 274 (also 96 FB 2L 410 AA). I gave my local Ford Dealer, Hills Ford, a call while our Mondeo was in for an MOT. Carl is the chap to speak to and has always been helpful and knowledgeable over the years. He could find the valve on the system and it retails at £49.56 + VAT (£59.47). This is a saving over buying from a TVR specialist, £72 at Racing Green. Despite looking, Carl couldn’t find any technical details and suggested I tried contacting Ford directly. I have also had a chat with Jo at CAT Driver Training. I explained that the ongoing problems and the arrival of a new baby meant I would like to delay the course further and she was very good about it. I feel bad about messing them around but she has always been very helpful and cheery. Not long after buying the TVR, we found out that out family of two was going to become a family of 3. This car most definitly doesn’t seat 3. 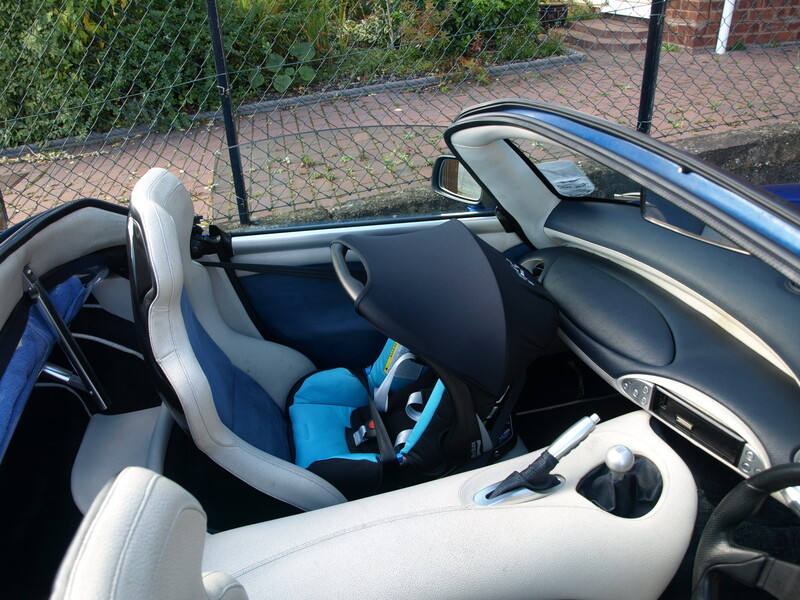 Our new baby boy arrived in September, but I was determined it wouldn’t stop be driving the car, so it had a couple of good outings while I was on paternity leave. 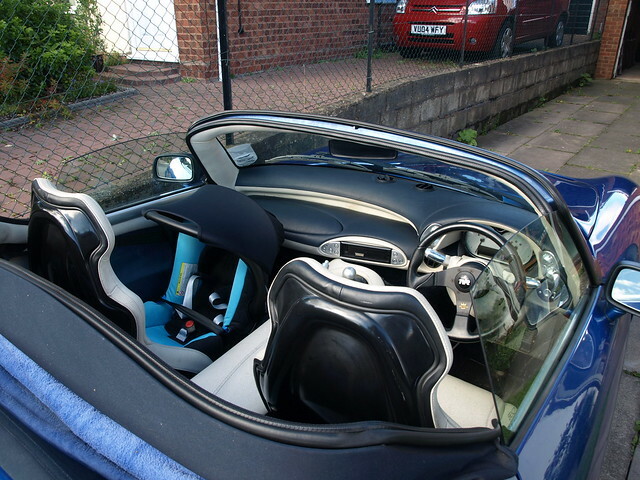 We found out that despite being bulky the babyseat we have fits into the TVR. Lucky it doesn’t have front airbags.